The chic Chanel European themed hoarding within Vancouver’s Holt Renfrew confirms that the legendary luxury brand will expand by relocating its concession to a larger, ground-floor ‘flagship’ location. Chanel expansion: It is not speculation anymore! 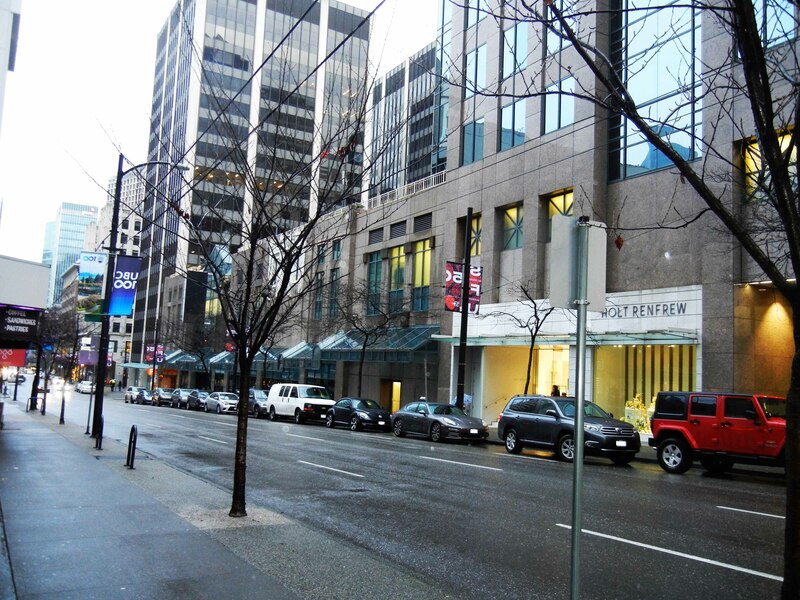 Holt Renfrew as seen from Granville & Dunsmuir Streets. Main floor European themed hoarding, announcing Chanel, where the salon and spa once were. 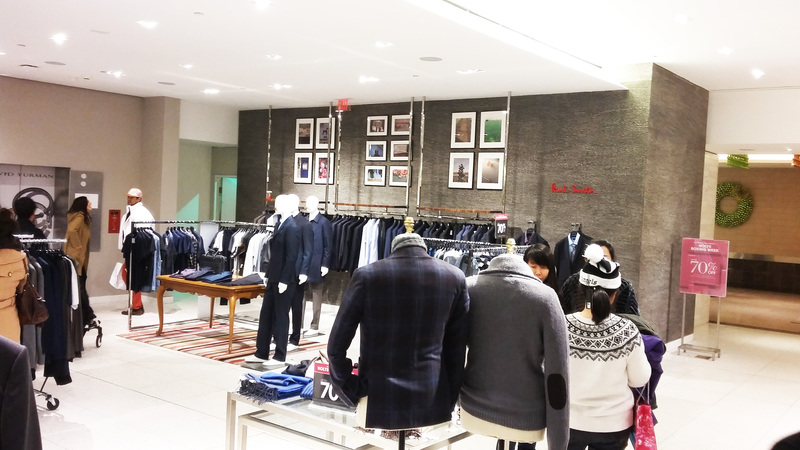 According to Retail-Insider, the move is the latest within Holt Renfrew, as it continues to expand and renovate its CF Pacific Centre store to address competition from the mall’s recently-opened and wildly successful Nordstrom flagship. 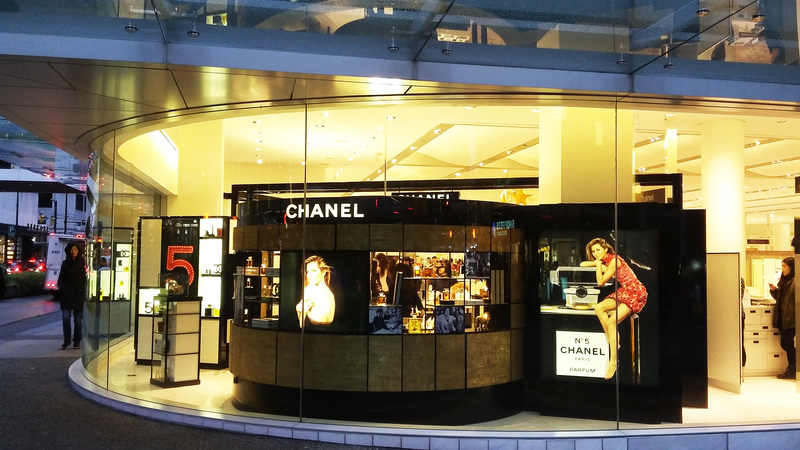 Chanel beauty concession on corner of Granville and Dunsmuir Streets. Focal point of walk/drive-by traffic. 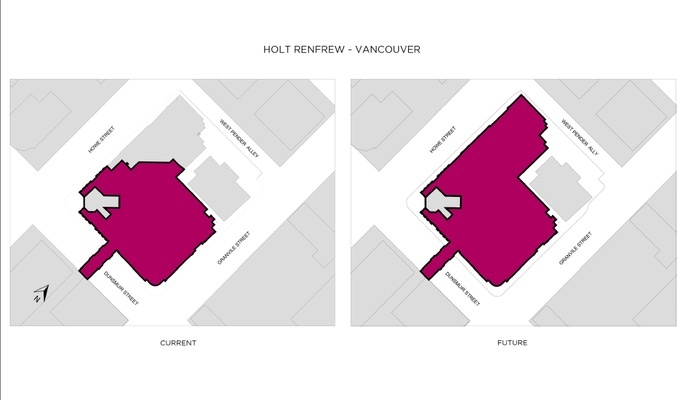 Chanel will vacate its current 1,900 square foot, third-level Holt Renfrew concession space for a larger street-front location within Holt’s, in space formerly occupied by Holt’s salon and spa. 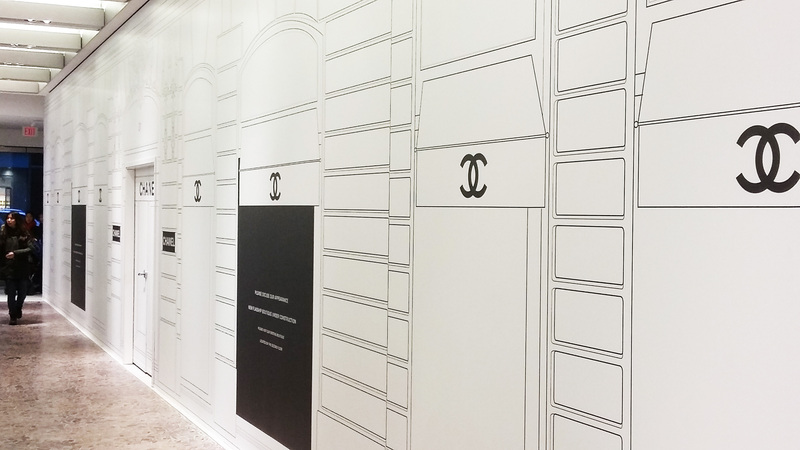 The new Chanel store is under construction, and sources say that it will open mid-2016. 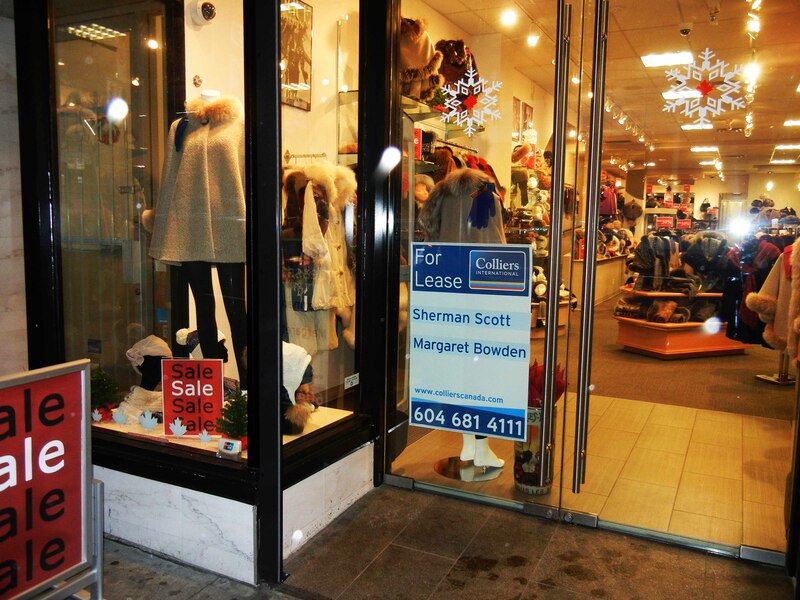 A separate source in Holt’s menswear department implied a café component will be included with frontage on Dunsmuir Street, and that Chanel may gain a dedicated Howe Street entrance as part of the expansion. Holt Renfrew entrance on Howe Street next to currently unoccupied space formerly housing SportChek / Atmosphere. Potential Howe Street entrance of Chanel expansion. When Holt Renfrew relocated its Pacific Centre flagship in the spring of 2007, Chanel opened an accessories-only concession on the store’s third floor. The concession expanded in 2010 to include ready-to-wear. 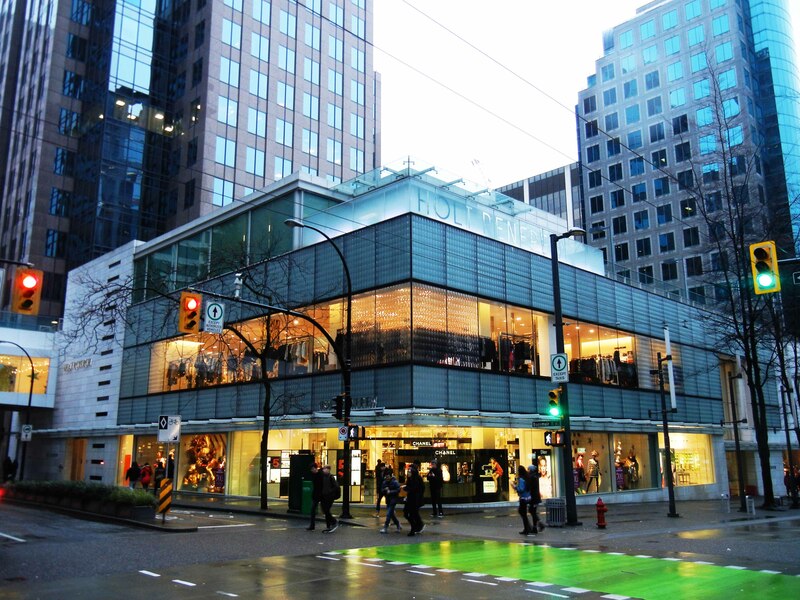 Holt Renfrew is in the process of spending millions to renovate its Vancouver flagship. Currently, Holt’s is 147,000 square feet and the store will annex an additional 40,000 square feet formerly occupied by Sport Chek/Atmosphere, with renovations expected to be completed by the end of 2016. This past September, Nordstrom opened a 230,000 square foot luxury designer-heavy flagship a block south of Holt’s and industry insiders questioned whether Vancouver could sustain luxury level boutiques. The ‘Luxury Zone’ at Alberni and Thurlow Streets are at commercial capacity and 2015 saw newcomer CICINO opening in the ‘The Heritage District on West Hastings’ possibly with hopes that the ‘Luxury Zone’ would spill over. One cannot help but feel as 2016 approaches, there is no doubt that there is a steady influx of discretionary income from affluent locals and tourists interested in and purchasing luxury items and this luxury shopping trend is going to continue. Menswear department in the lower level of Holt’s will be reorganized. The Paul Smith concession to be relocated to accommodate Chanel expansion. Chanel has a long history in Vancouver, and the mere mention of its prestigious name brings anecdotes of first purchases and, ultimately, its inability to gain a foothold in Vancouver. 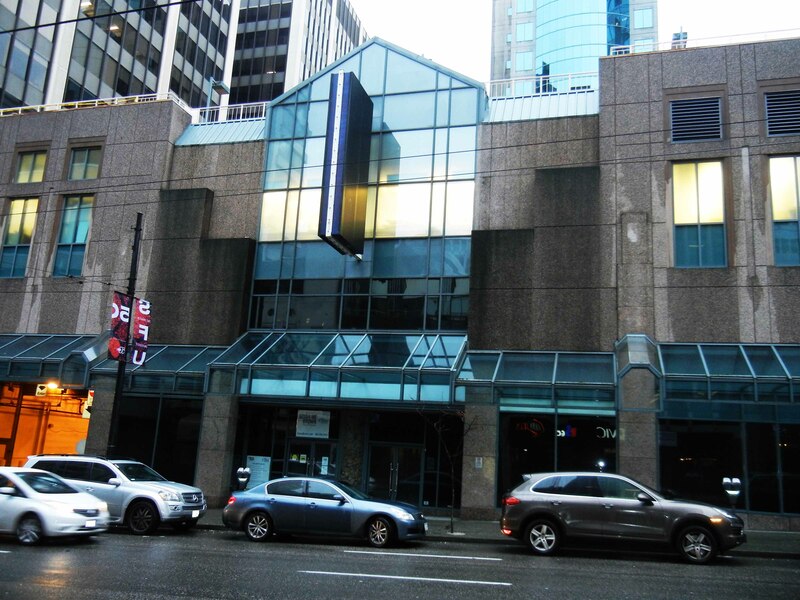 Chanel began with the first freestanding location, measuring 1,300 square feet, which opened in 1991 at 755 Burrard Street (now occupied by Coach). Several years later, it relocated to a 5,000 square foot, two-level store at 900 West Georgia Street, which closed in the summer of 2010, apparently due to poor sales. Who else is counting the days until we can relax in the café, enjoy an strong espresso, French petit fours, and people watch on a revitalized Howe Street devoid of ‘For Lease’ signs? Snowflake Furs on Howe street on the move again most likely due to industry decline and weekly protests against animal cruelty. (This article and photographs by Helen Siwak were originally published in in VancityBuzz).